Happy Valentine’s Day! 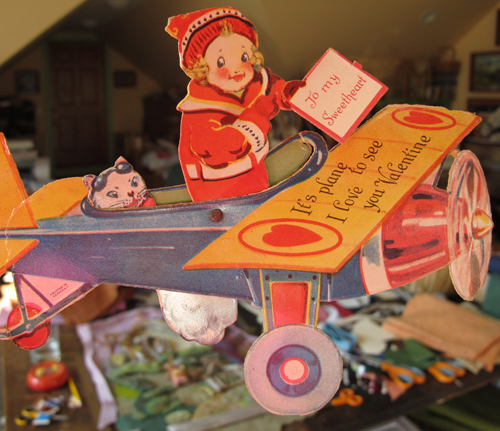 I found this cute old valentine in my mother’s things. The pilot and her feline co-pilot are flying over my work table, which is covered with a new project I’ve been working on since the new year. I know its cruel to tease like this, but I wanted to show that I’ve been working. It’s a large piece and will probably take most of the winter to complete. I’m the type who needs to finish a project before showing any one. I’ve been taking pictures along the way, though. I find that I am lost in that magical creative space for long lengths of time and forget to step out of myself in order to take pictures, but I’m trying my best. This project is an ever-changing experiment, something I want to experience, without having to explain what’s happening during the process. That can come later. I’ll tell this much– there are rabbits involved! This entry was posted in Inspiration, Treasures by Salley Mavor. Bookmark the permalink. Sweet valentine! I’m sure whatever you’re working on, it’s going to be great! Happy Valentine’s Day to you Salley! My grandmother gave me some old Valentine’s Day cards that she and my grandfather exchanged–they’re still in a box in the Philippines that I’m getting ready to ship here to CT. Some of them look like the one you posted! How curious this new project sounds…and a bit “hare-raising” perhaps. No matter what, I am sure it will be wonderful. Personally, I have always loved rabbits so this new creation sounds especially intriguing. 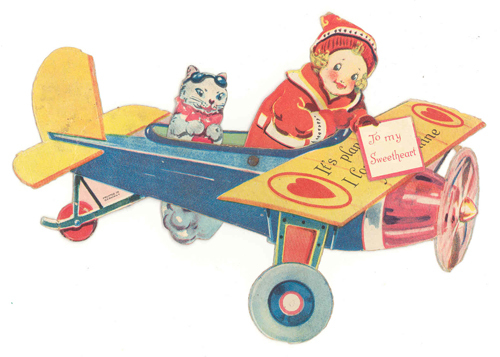 I also have several Valentines from the 20’s, 30’s and 40’s, but this one is new to me. It is precious. Mine are displayed on my mantle, and elsewhere, reminding me to spread lots of love and care. Thanks for doing the same! LOVE that Valentine. The card and Valentine art from that time is so sweet. I can’t wait to see what you’re working on – it IS the Year of the Rabbit so it sounds perfect! Now, I can hardly wait to see it! I do understand the thrill of working out the piece in peace! Have fun.